Internet Explorer version 9 (beta) is now available for free download from Microsoft. New version promises lot of new features and enhancements allowing better integration with Windows 7 operating system. Internet Explorer 9 has improved streamlined design with fewer dialog boxes to click through. It also support lot new features that improves speed of web browsing. 1. Streamlined design with compact interface with most command bar functions, like Print or Zoom can now be accessed by clicking the Tools button. 2. Pinned Sites allows you to access regularly visited websites directly from the taskbar on your Windows 7 desktop. 3. Integrated download Manager is a powerful new feature that keeps a running list of the files you download from the Internet and notifies you when a file could be malicious. 4. Enhanced tabs allows you to move easily between multiple open webpages in a single window. You can tear-off tabs allow you to drag a tab out of Internet Explorer to open the tab’s webpage in a new window. 5. Search the web directly from the address bar of new Internet Explorer. 1. Open official Internet Explorer homepage on Microsoft website. 2. Click ‘Download Now’ button. 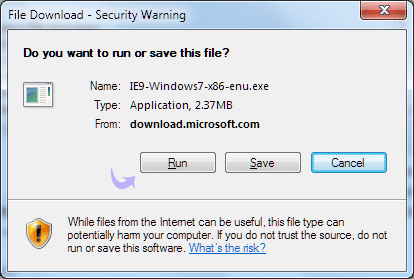 Then click ‘Run’ button on the pop-up dialog box. 3. Click ‘Continue’ in the User Account Control dialog box and then update for Internet Explorer 9 will be installed. 4. After IE9 updates are installed, you need to restart the computer to use Internet Explorer 9 browser. You can restart immediately or at a later time. Once PC is restarted, you can surf the internet in all new Internet Explorer 9 browser. Be aware that IE9 is a beta and some people have had an unhappy time – how to remove IE9 is quite a common question. Also be aware that if IE9 breaks your internet explorer and you are unable to fix it you will not be able to do any updates – Microsoft requires that you use IE for this. If you try to upgrade it, downgrade it or even use it for browsing it may break and then you can’t do any updates. If you are really dedicated to using IE then at least download another browser SOON so that when IE stops working you can get some online help.